Gifted: Check out the 2013 senior class gift. 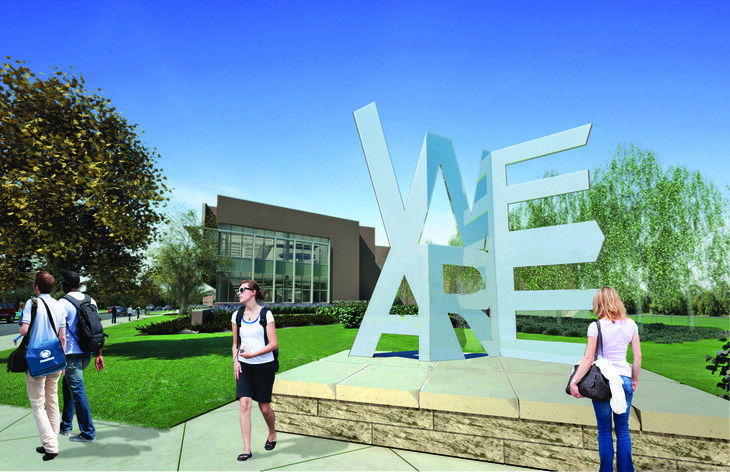 Shown here in a computer rendering, which was presented at today’s Board of Trustees meeting, the 12-foot, stainless steel “We Are” sculpture will be located on the east side of the IM Building, near the intersection of Curtin and University. Artist Jonathan Cramer ’94 was inspired by Philadelphia’s “LOVE” sculpture and the famous Chicago “bean.” Construction is set to begin this summer. Shedding light: A powerful documentary produced by a team of Penn Staters is about to reach an international audience. Directed by Penn State film professor Barbara Bird, Toward Daylight was selected for Culture Unplugged, an online film festival that has attracted more than 60 million viewers. The documentary explores suicide preventation and tells the personal stories of people affected by depression and suicidal thoughts. “As I researched the issue in Centre County, I was amazed by the number of people touched by suicide,” Bird told Penn State News. To view the full documentary, visit the film festival’s website. Entry filed under: Uncategorized, University Park. Tags: Barbara Bird, Jonathan Cramer, Larry Johnson, Toward Daylight.